I always like to make special treats for holiday breakfasts, and recently I made a new casserole I’d like to share with you. 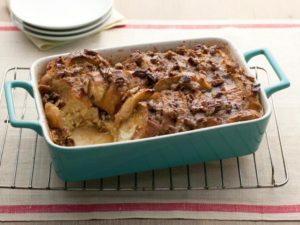 Cinnamon roll French toast casserole was such a big hit that I’ve added it to my holiday breakfast menus. It’s so easy you may want to make it weekly! Grease an 11×7 casserole dish with butter. Place a single layer of bread on the bottom. You may need to break some in half to cover the bottom. Spread cinnamon mixture over bread then place another layer of bread on top. Whisk together egg mixture ingredients and pour over bread. Cover and refrigerate overnight. When ready to bake remove from refrigerator and allow to sit for 20 minutes before baking. Optional: sprinkle the top with a cinnamon/sugar mixture. Bake in 350 degree oven for 40-45 minutes.